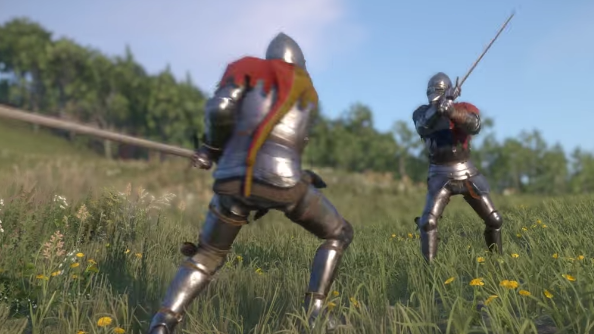 We’re all very excited about Kingdom Come: Deliverance. It’s trying to do a lot of new and ambitious things, but among the most exciting is its stealth system. Or even systems, plural. As Phil and Matt demonstrate, there are different ways to be a sneak. Will this game join the ranks of PCGamesN’s favourite RPGs? First we run through the more traditional approach to taking out enemies – sneaking up behind them in the tall grass and choking them out. Nothing particularly new about that, but there’s a nicely animated struggle which really zooms in on the player-character’s hairy fingers at one point. But then there’s social stealth: the idea that the clothes you wear, or the language you speak, might allow you to access otherwise restricted zones. We try that out by speaking the few words of Hungarian we know to a guard in front of an enemy camp. He lets us in, which allows us to run amok in there, setting fire to barrels of arrows so the enemy’s left largely unequipped. Developers Warhorse aren’t doing half-measures when it comes to setting the time and place, either – you can read more about Kingdom Come: Deliverance’s historical accuracy if that’s your kind of thing. And if you enjoyed this video, why not subscribe to PCGamesN on YouTube?